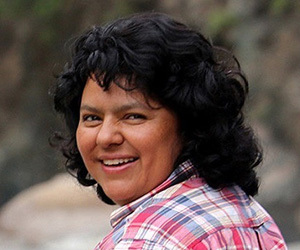 Less than two weeks after the murder of Honduran eco defender Berta Caceres, another indigenous leader has been shot dead during the violent police and military eviction of 150 families from the settled community of Rio Chiquito. International funders of the controversial Agua Zarca hydro project are now backing out. Nelson Garcia, a leading member of COPINH, the same indigenous rights group as murdered activist Berta Caceres, was assassinated in Honduras yesterday. The murder took place during a violent eviction of 150 families from community-occupied land at Rio Chiquito in the town of Rio Lindo, Cortés Department, attended by 100 policemen, 20 military police, 10 soldiers and and several DGIC (Direccion General de Investigactiones Criminales) officers. A COPINH protestor with Honduran policeman. Photo: Felipe Canova via Flickr (CC BY-NC). « We regret to inform that Comrade Nelson Garcia was killed when he arrived at his mother’s house for lunch, after having spent the morning helping to move the belongings of families evicted from the community of Rio Chiquito », reports COPINH, the Council of Indigenous Peoples of Honduras. Garcia was shot four times in the head by unknown gunmen. But given the close proximity of so many security forces it is hard to see how the murder could have been committed other than with official support, complicity, collusion or participation. The eviction began early yesterday using tractors and heavy machinery to destroy wooden houses where the families had lived for nearly two years. The tractors were also used to destroy community gardens and crops of cassava, sugar cane, banana and corn. Nelson Garcia was an active member of COPINH, a leader of the Rio Chiquito community and a defender of its right to remain in its communal living space. COPINH has been active in the area for 22 years undertaking advocacy, construction work and community defence activities. He is now the third COPINH leader to be killed, along with numerous other members and activists. Berta Caceres’s fellow Copinh leader Tomás García was shot dead by a military officer in a protest in 2013. Since the murder of Caceres in La Esperanza on 3rd March, says COPINH, Honduran authorities have demonstrated « zero interest » in investigating the crime or in protecting other members of the organisation, whose leadership has instead been harrassed while those making threats against them remain uninvestigated. In another incident security guards at the controversial four-tier Agua Zarca hydroelectric project on the Rio Gualcarque threatened demonstrators with live shotgun blasts. Fortunately no injuries resulted on that occasion. The murders of community activists at Rio Chiquito are just a small part of a much wider pattern of violent attacks against human and environment rights activists in Honduras that followed the US-backed 2009 coup d’etat that overthrew the progressive left wing government of Manuel Zelaya. Over 100 campaigners were killed in Honduras between 2010 and 2014, according to Global Witness in its study ‘How Many More?‘. It said a disproportionately high number of them were from indigenous communities who resisted development projects or the encroachment of farms on their territory. The assassination of Berta Caceres, and now Nelson Garcia, has focused international scrutiny on the Honduran government and supporters of projects like the Agua Zarca dam project. China’s Sinohydro and the World Bank’s private sector arm, the International Finance Corporation, had already pulled out of the project before Caceres’s murder. They have now been followed by FMO, the Dutch development financier, which today decided to« suspend all activities in Honduras, effective immediately » and withdraw its $15m loan offer. FMO said in a statement: « This means that we will not engage in new projects or commitments and that no disbursements will be made, including the Agua Zarca project. »Finnfund, the second European financier involved in Agua Zarca with $5m committed,suspended its support as well. The Central-American Bank for Economic Integration (CABEI) is now under increasing pressure to suspend its support for Agua Zarca along with German companies Siemens and Voith. With $24 million, CABEI extended the biggest loan for the dam project. « We stand in solidarity with our dear comrade Berta and the Lenca people and all Hondurans who are valiantly resisting displacement in their territory », said activist Jake Dacks. If USAID is serious about involving communities in development, they will listen to the Lenca people and stop working the DESA-Agua Zarca hydroelectric project immediately.